We’re so excited you’ve decided to take some time to get to know us here at Duplain! 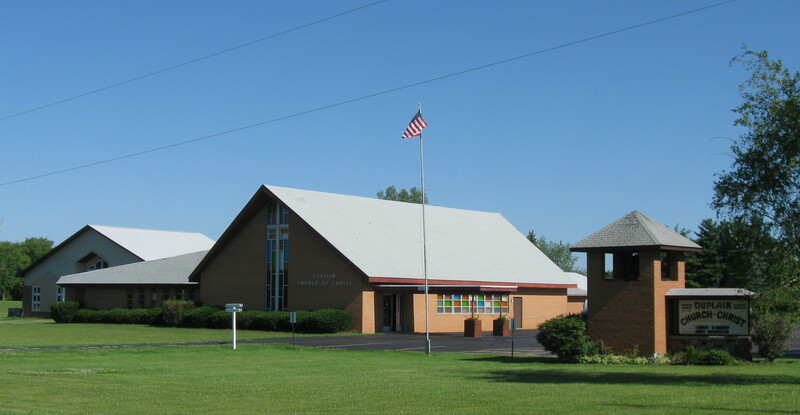 Duplain Church of Christ is located in the country between the towns of St. Johns, Ovid, and Elsie. We are a family friendly environment and welcome everyone to come as they are to join us for one of our services or Sunday School classes. Duplain exists to reach out to our community in order to introduce people to Jesus, raise them up toward a life-changing faith, and ready them for ministry in the church and world. At Duplain we have identified 4 things or core values that we believe as a church it is essential that we maintain. Staff, programs, and even the building may change, but at Duplain these things won’t. As a church, it is important that we…. While our mission and values help you to know a little bit about us and what matters around here, nothing beats meeting us in person. We would love to welcome you into our family and have you join us as we seek to reach out, raise up, and ready for ministry!